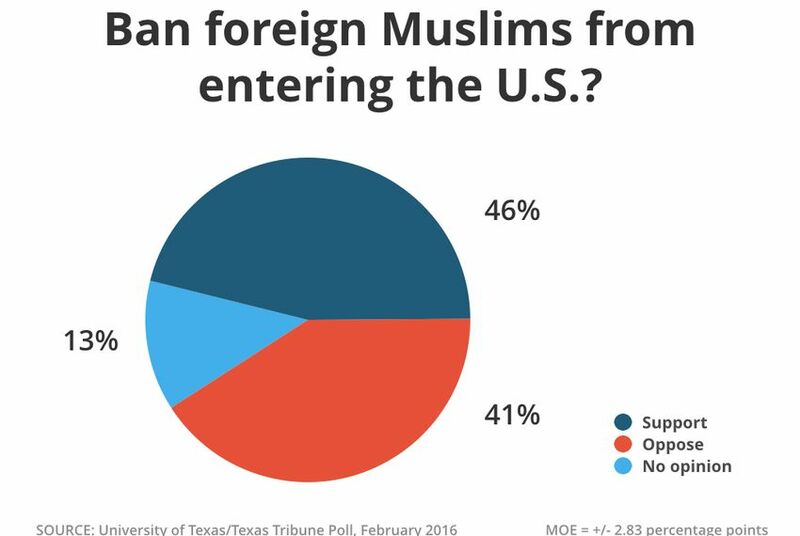 Almost half of the state’s voters support banning non-U.S. Muslims from entering the country, and more than half support immediate deportation of undocumented immigrants now living the U.S., according to the latest University of Texas/Texas Tribune Poll. Forty-six percent of Texas voters said they would support a ban on non-citizen Muslims entering the country, while 41 percent said they would oppose it. Within those groups, 26 percent said they would “strongly support” such a ban and 22 percent said they would “strongly oppose” one. The overall numbers cloak partisan and racial differences. For instance, 58 percent of Democratic voters would oppose banning Muslims from entering the country, while 53 percent of independents and 62 percent of Republicans would support a ban. Among voters who identify with the Tea Party, 78 percent said they would favor a ban. White voters would support a ban 49 percent to 41 percent, and Hispanic voters by 45 percent to 38 percent. Black voters, however, would oppose such a ban: 38 percent said they would support it while 48 percent would oppose it. 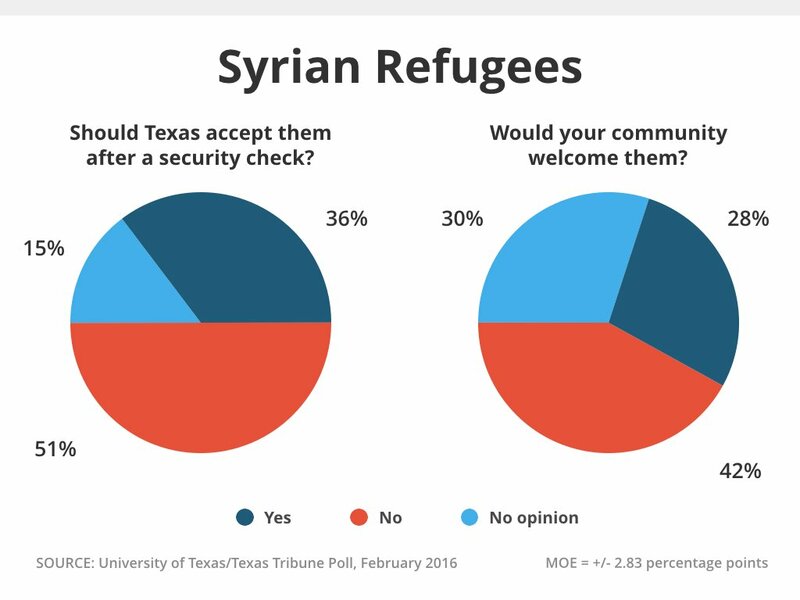 Just more than half of the voters said they would disapprove of accepting Syrian refugees into Texas even with a security clearance process in place. Another 36 percent said they would accept those refugees. Voters were slightly less negative about what would happen if some of those Syrian refugees moved into their communities. They would not be welcomed, according to 42 percent. They would be welcomed, according to 28 percent. The rest — nearly a third — either said they didn’t know or had no opinion about it. Democrats and Republicans split on that question, with 58 percent of Democrats saying Texas should accept Syrian refugees and 76 percent of Republicans saying the state should not accept them. Asked about immigration in general, a small majority — 53 percent — agree with this statement: “newcomers from other countries enrich Texas with their hard work and values.” About a third disagreed with that statement. 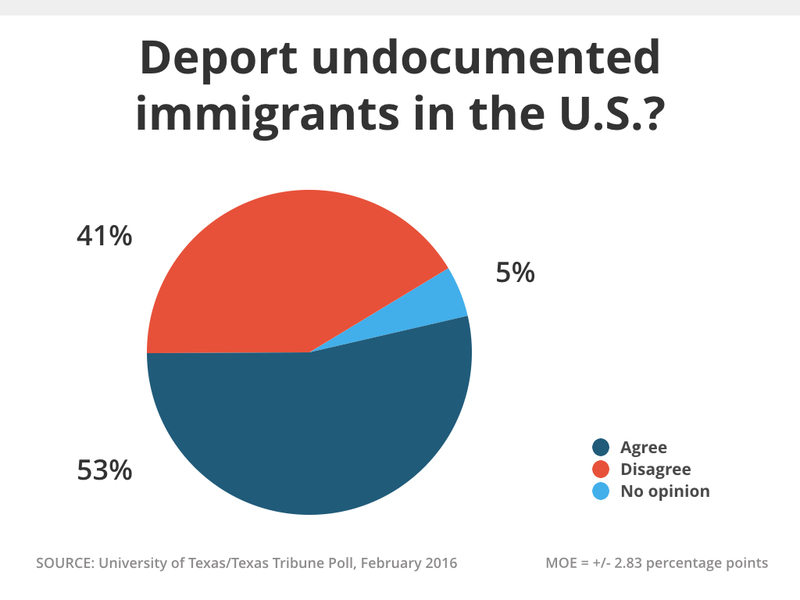 A similar majority, however, agreed with this statement: “undocumented immigrants currently living in the United States should be deported immediately.” About two in five voters disagreed. “Talking about border security is a winner, but excluding or deporting all these immigrants, it’s not workable for candidates,” said Daron Shaw, a government professor at UT-Austin and co-director of the poll. Shaw said that appeal — that some immigrants have broken the law coming to America — is part of what has worked for Donald Trump in his rise to the top tier of Republican candidates. The partisan splits in reactions to the deportation statement are striking: 74 percent of Republicans and 56 percent of independents agreed with that deportation statement, while 59 percent of Democrats disagreed. Among Republicans who identify with the Tea Party, 86 percent agreed. While 38 percent of Hispanic voters in Texas agreed with the statement, 59 percent of white voters and 50 percent of black voters agreed. More than half of the Hispanic voters surveyed disagreed with the idea of immediate deportation. Sanctuary cities, where “local law enforcement officials do not actively enforce some federal immigration laws,” have the support of only 21 percent of Texas voters; 59 percent oppose those policies. An overwhelming share of Republican voters — 87 percent — disapproves of sanctuary cities. Sixty-two percent of independent voters take the same position. Democrats are divided: 36 percent approve, 34 percent disapprove, and 30 percent take no position. Two-thirds of white voters and just less than half of black voters disapprove of sanctuary cities. Hispanic voters are divided, with 33 percent approving and 39 percent disapproving. The University of Texas/Texas Tribune Internet survey of 1,200 registered voters was conducted from Feb. 12 to Feb. 19 and has an overall margin of error of +/- 2.83 percentage points. Among self-identified Republican primary voters, the margin of error is +/- 4.27 percentage points; among self-identified Democratic primary voters, it is +/- 4.57 percentage points. Among likely voters in the Republican primary race, the margin of error is +/- 4.86 percentage points. Among likely voters in the Democratic primary race, the margin of error is +/- 5.44 percentage points. Numbers in charts might not add up to 100 percent because of rounding. This is one of a series of stories from the latest University of Texas/Texas Tribune Poll. Also today: Texans on handguns and other issues. Tuesday: How the candidates stand a week before the Republican and Democratic primary elections. Wednesday: Voter impressions of the presidential candidates. Tomorrow: The mood of the state.